As with all "bends," the fisherman's bend joins the ends of two ropes. An advantage of the fisherman's bend is that it is relatively small. The potential downside is they are very difficult to untie after holding a heavy load. Because of this, the fisherman's bend is primarily used to join ropes that will not need to be untied (e.g., to create Prusik loops). When this bend is tied using overhand knots, it is simply called a fisherman's bend. When the individual knots are tied with two wraps (as shown below), the individual knots are called double fisherman's knots and the resulting bend is called a double fisherman's bend. The knots can also be tied with three wraps (i.e., triple fisherman's knots). This illustration shows the steps to tie a double fisherman's bend. Wrap one rope around another rope twice while working back toward the rope that is doing the wrapping. Pass the tail of the rope back through the wraps (the green rope in this illustration). Repeat this process using the end of the other rope. To make sure the wraps will align correctly, it's easiest to turn the ropes 180° before making the second set of wraps. 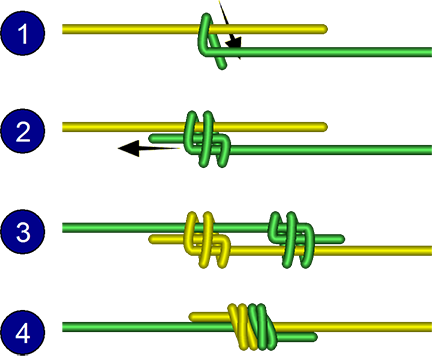 For example, in step #3 of this illustration the ropes were turned so the green rope was on the left before the green rope was wrapped with the yellow rope. Dress the knot. When tied correctly, the two knots should "miter" together as shown here. A double fisherman's knot can also be used to create a stopper knot near the end of a rope.